The Plymouth Citybus paint shop is getting busier with quite a few repaints due to go through over the coming few weeks. Work has started again on the newer Darts that have not already been repainted. The Volvo B7RLEs are being repainted out of Blue Flash into Swoops. These will soon be seeing more work in Cornwall. Thanks to Richard Smith for the new photos, I did get 60 on camera but his photos of this one are a lot better than mine! On the subject of photos, both Richard and myself are more than happy for our photos to be used by others but can I ask that if you do want to use them elsewhere please ask first! Permission will almost always be given. There have been a few cases recently where our photos have been downloaded into personal facebook albums as if the facebookers had taken the photos themselves. If you ask nicely first then its not stealing. Thanks. 106 was of course new in the dark fronted livery which didn't look too bad on these buses, although I still think the swoop is a lot better. 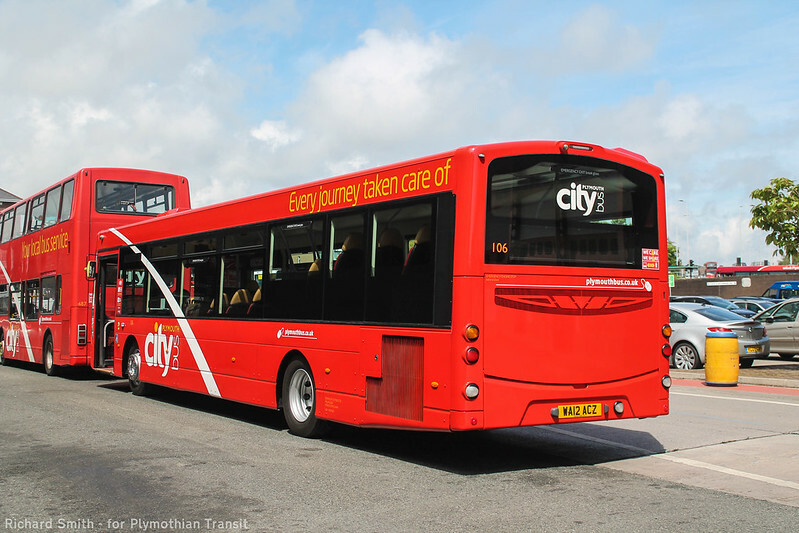 There are lots of rumours and guesses about what is coming up over the next month or so, but the plan as I understand it is that the new Enviro City double deckers due next month are for the 21/21A (currently Red Flash). These will NOT be in Red Flash livery. I have heard several different views of what they will be in, but we will just have to wait and see - it wont be long! 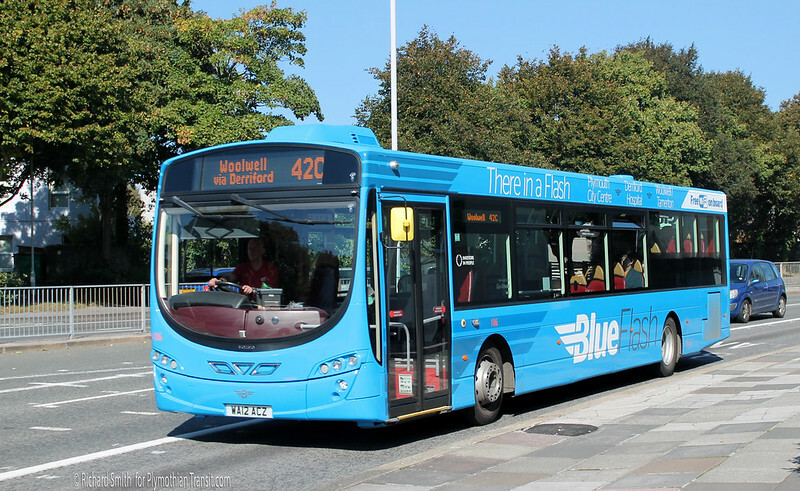 The Red Flash Enviro 400s will then go onto the 40/41/42 routes which will become Red Flash instead of Blue. The Blue Volvos as mentioned above being swooped for Cornwall. What livery will the new buses be in then. It is a shame that the blue flash is going and the 40/41/42 don't need double decks it is the 35/35a/61/62 that needs the double deckers. we will have to wait and see what the new livery is. Lots of rumours but no hard facts yet. The 42 could def do with DDs - try catching as 42 out of Derriford in the morning / evening - they are all packed. DD's definitely needed on the 42abc's packed to standing usually. I have never seen or driven a 61/62 with standing passengers!? So Red Flash becomes something different but blue flash becomes red flags? blue flash becomes red flags?...Please explain. I'm not 100% of the accuracy, but when soeakinrbg to a PCB driver some time ago he said that the Red Flash route is one of the most profitable for Go Ahead Group outside of London. Would be interesting to see if this was to get a branding review of sorts, something like the Stagecoach Gold or The Platinum branding elsewhere up country. 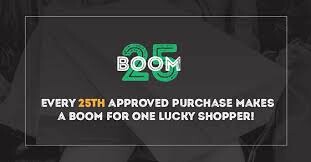 Still, which ever, it will be good to see. So that's the current Red & Blue Flash explained fleet wise but are there enough Green Flash buses now after the double-decks lost that colour scheme or do red swoops now randomly appear on the 5/5A Graham? Moving the red buses to another route is easier then repainting them all. Prehaps the blue will reappear on a different route in due course. New deckers on 21/21a, moves red buses to 42(40/41), blue eclipses changed to serve cornwall, presumably withdrawing older deckers and remaining R/T/X/Y vehicles. Also of course a couple of green ones now missing on the 5/5a as the deckers went yellow. Hmm, a case of watch this space I guess! It's a pity that the B7RLE's are not staying on city work - the 35/a/61/62 could definitely do with an upgrade, as could other city services. 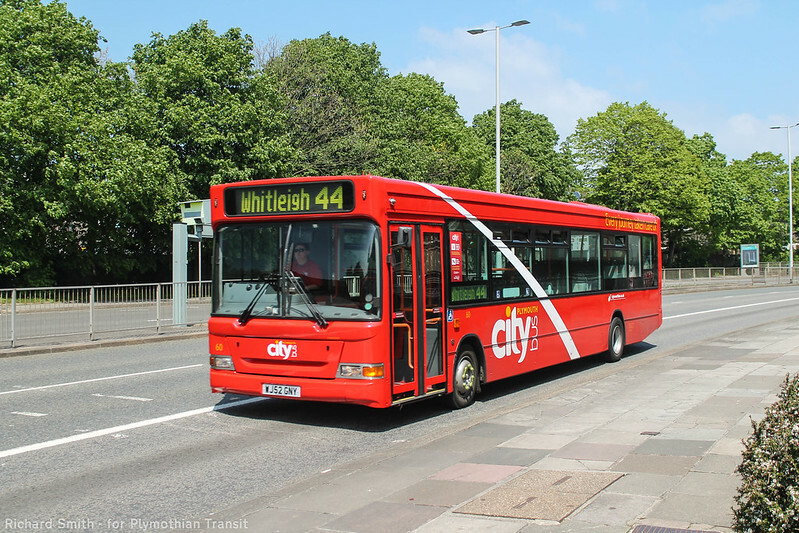 I do have to agree with you on the 42, as it is the main service to Marjohns - However I think Plymouth Citybus need to consider increasing some of the corridors to encourage more people to use their services - too many services cut making them less attractive to customers. To Curtisc. The Eclipses are totally unsuitable buses for the routes you mention. They're not actually suitable for the 42s either. Too small, capacity wise, for Royal Parade to Derriford and too long for negotiating the roads through Tamerton Foliot. double deckers are needed i think on the 42 route but for the 42A/B i think not as when the DDs ran down there they had trouble with the trees and that tight hill, maybe a single deck for tammeerton part only? like just the 42a/b only having single decks and the 42/c double decks? I just feel that these high-spec vehicles will be wasted on the Cornwall services, when vehicles of this specification would be better for city services. 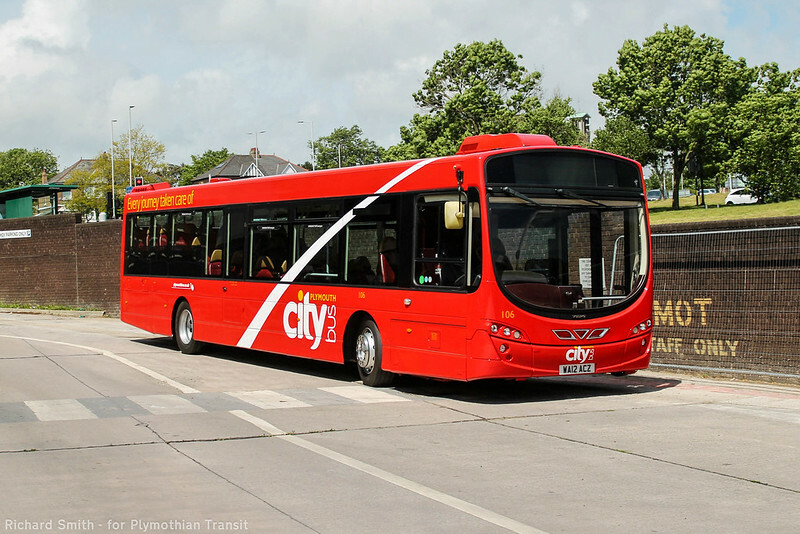 Mercedes Citaro's have managed the 35/a/61/62, which are the approximately same length (12m) - but if these are too long, something better is still required and on other routes like the 44 than the darts mostly seem, which are now over ten years old. I disagree. 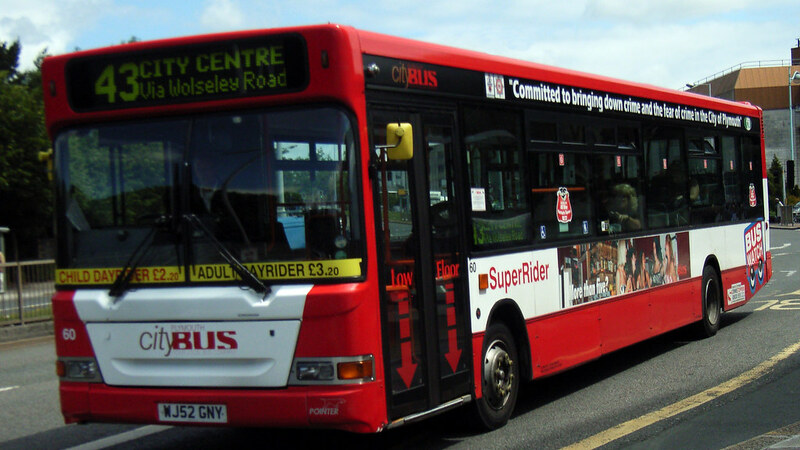 As a regular user of their services in Cornwall and reliability and comfort of these vehicles is very much welcomed. The Cornwall service routes are often longer duration and there are challenging logistics of dealing with vehicle breakdowns in these remote locations. Skimping on the use of an older and more unrealiable fleet on these routes is a false economy. 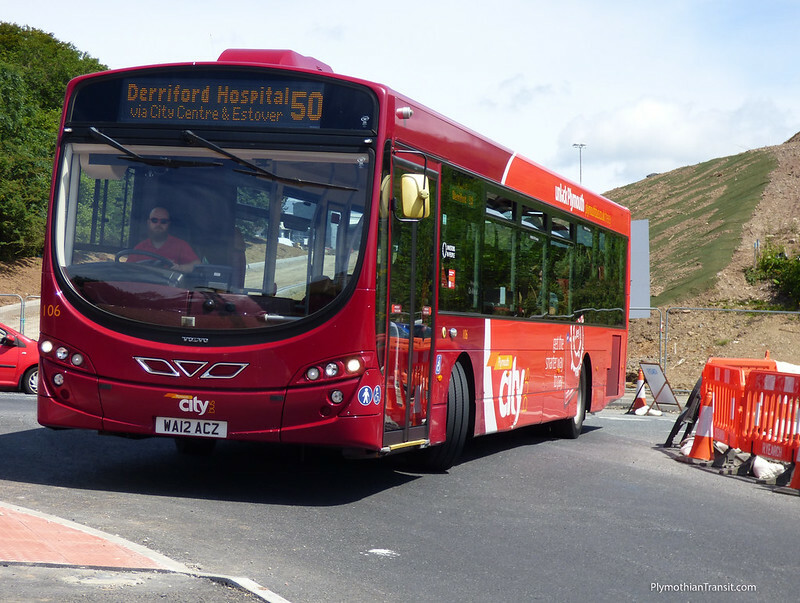 Dart 61 now in red swooped livery. B7 107 now in the body shop being rubbed down prior to repainting. Enviro 400 531 has been damaged in a collision with a motorcycle in Cornwall. 531 repaired and back in service. 107 now in red.